The Italian for wait (for), is the regular -ARE verb aspettare. ... imagine you wait AS PET HARRY is sick. Aspettare is a regular -ARE verb conjugated like thousands of other -AREverbs. Conjugate this and you'll be able to conjugate other -ARE verbs. For the month of March we cover a new -ARE verb every day. aspettare (a) can also mean; to await. - farsi aspettare : to keep people waiting. - l'attesa (nf) : wait. / un'ora di attesa : an hour's wait. Don't wait for long, learn Italian using proven techniques like Cartoon Memory Triggers. To remember a word, just think of the pic! 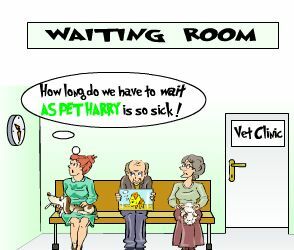 You wait (for) AS PET HARRY is sick! non aspettare! (non) aspetti! (non) aspettiamo! (non) aspettate! (non) aspettino! ✔ Aspettare is a regular -ARE verb, these being the most common verbs in Italian. ✔ Learn aspettare and it will reinforce the pattern for ALL those other -ARE verbs. ✔ You can more easily remember words and verbs like the Italian for wait (for) aspettare using the techniques of the world's Memory Masters. 200 Words a Day! Free Daily Italian Lesson Online - the verb in Italian for wait (for), is aspettare - fully conjugated. Italian Learning Made Fun and Fast with your free Daily Italian Verb Lesson - aspettare.